I’d like to tell you about someone quite obscure – although I am certain that everybody here – apart from the very smallest - will have heard of him! He lived 1600 years ago, in an Greek town called Myra. Today Myra is in modern day Turkey, and it is in ruins. We don’t know that much about him. He was a Christian born to a well-off family. We know that he was really serious about his Christian faith, and he was deeply committed to Jesus. When his parents died, he took Jesus’ command to ‘sell everything and give to the poor and come follow me’ quite literally. He gave away his wealth; he became a priest, and subsequently the bishop of Myra. 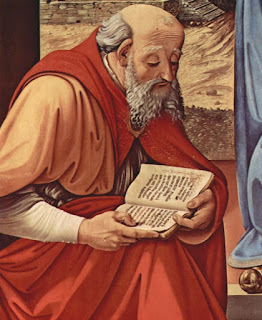 Although nothing was written down, they told stories about him: about his love for God, for God's word and his love for people; and about how God did astonishing things through him. The song of the cleaner. A talk for a carol service. I would like you to imagine that you have gone to a concert. The auditorium is vast. The orchestra is huge. You’ve come for the full works – to be blown away. The lights dim. Everything goes quiet. And then the cleaner walks onto the stage. He’s in his overalls and he’s got a broom. And as he sweeps, he begins to sing: quietly, so you have to really listen if you want to know what he is singing, but loudly enough so that if anyone wants to hear, they will be able to hear. It is not what anybody is expecting. It is embarrassing; It is awkward. People start to fidget and cough. Some begin to laugh at him. And after a few minutes they go back to doing what they were doing before. They ignore him. But there are a few who, despite the rising noise, do try and listen. At Christmas God opens the door of heaven and walks onto the human stage. But it is not what we are expecting. Yesterday I was on retreat at an Orthodox monastery, and I was speaking with one of the monks. I told him I was struggling with a talk for St Nicholas’ Day, trying to put together his story and the passage for the day. 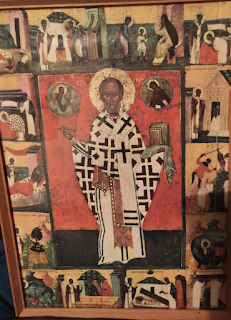 But I then said that I had noticed that I had been put in a room with not one but two icons of St Nicholas. He said – slightly mischievously because he knows the tradition I come from - that perhaps I should pray to St Nicholas. Well I did pray: to the one to whom St Nicholas prays. We know very little about St Nicholas. He was bishop of Myra around the beginning of the C4th. But over time stories have been told about him.